Lapeer County Prosecutor Byron Konschuh took a turn on the hot seat this afternoon, fielding legal questions for over an hour from an inquisitive rabble of 5th graders at Schickler Elementary. It was his way of making Constitution Week (Constitution Day was Monday) a little more relevant for the students. After a short opening statement filled with general themes including the duties of a prosecutor, the supremacy of federal law, individual rights and legal jurisdictions, Konschuh opened up the floor to questions. This, of course, is a dangerous proposition for students who, let’s be honest, are curious about basically everything. You could tell Konschuch was a little surprised at the familiarity with the law that many students demonstrated, as several of their questions pointed to the tenuous relationship between freedom and order in society. “You can’t put a dog on trial,” Konschuh said, as students took the opportunity to snicker a bit. 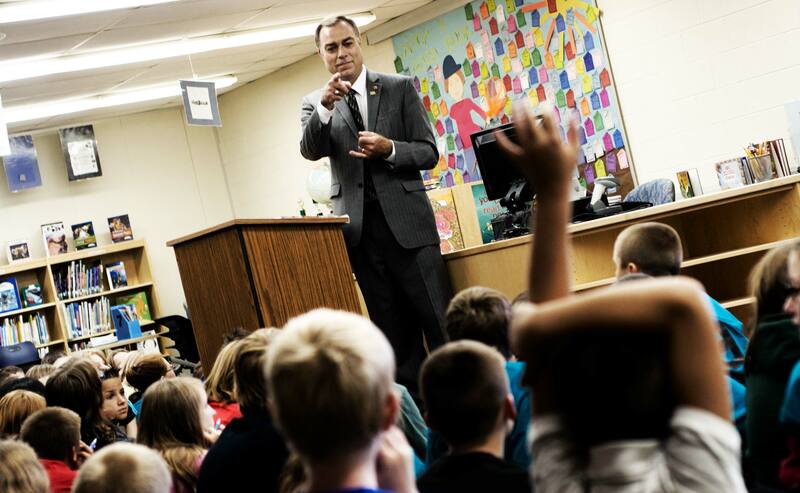 Lapeer Community Schools and Schickler Elementary would like to thank Byron Konschuh for giving our students the opportunity to learn about one of the foundations of our great democracy, the rule of law.